Breakfast is my favorite meal of the day! I love pancakes, eggs, breakfast potatoes, pastries…you name it! I often make breakfast foods for supper as well because they are just so darn delicious. 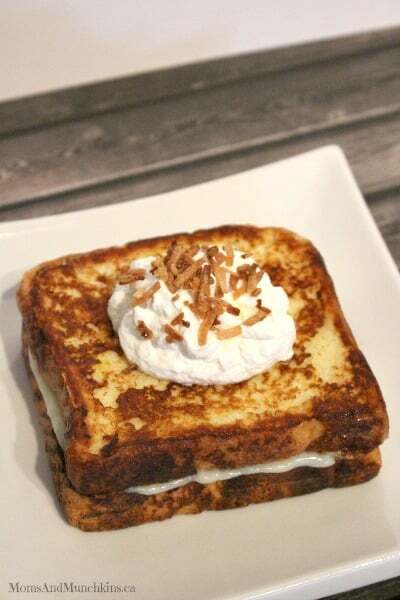 This Coconut Cream Pie Stuffed French Toast could be served for breakfast, brunch or even as a dessert after supper. It’s not overly sweet but it’s certainly a treat. I also considered substituting real milk for coconut milk in this recipe but I thought it may burn too easily. If you do try it with coconut milk, let me know how it works out for you! A delicious treat for brunch or dessert. Spread coconut on a baking sheet in a single layer. Toast in over for 10 minutes (turning after 5 minutes). Coconut burns easily so check it often. In a large bowl, mix eggs and milk together. Stir well to mix. Place a frying pan (lightly greased with cooking spray if it's not non-stick) on the stove on low-medium heat. On a large plate, pour some of the milk-egg mixture and place a piece of bread on top, soaking it on both sides. Place the toast in the frying pan and cook evenly on both sides. This take a few minutes to cook thoroughly. Continue this process until all the toast has been cooked. Once the french toast is slightly cooled, place one piece on a plate, spread pudding over top, sprinkle on a bit of coconut, top with another piece of french toast, top with whipped cream and toasted coconut. Continue with the remaining french toast pieces. This recipe make 4-5 stuffed french toast servings. For even more delicious ideas, pop over to our Easy Party Food and Family Meals page. We’re always adding new & tasty ideas. Never miss a delicious update by following us on Facebook, Twitter, Pinterest, Google + and Bloglovin’. BE STILL MY COCONUT LOVING HEART! PINNING! Hi, thanks so much for sharing at Weekend Potluck! If you are willing to link back within your post to our party next time, we would love to feature you sometime in the future!